Final Score: Get 'R Done 6 Crabby Joe's 4.Matt had 2 singles, 1 RBI and a run scored. Rose had 2 singles and a run scored. Bill had 2 singles. Brett had a double, 1 RBI and a run scored. Chris had a double and a run scored. Kevin & Lianna had a single and 1 RBI each. BIG & Robyn had a single each. Brett pitched 7 innings allowing 6 runs on 9 hits, while walking 2 and striking out 2. Final Score: Booty Bandits 6 Crabby Joe's 1.Caress had 2 singles. Brett had a single and 1 RBI. Jimmy had a single and a run scored. Bill, Matt & Lianna all had a single each. Brett pitched 7 innings allowing 6 runs on 11 hits, while walking 6 and striking out 3. Final Score: Second 2 None 13 Crabby Joe's 2.Lauren had 2 singles. Kevin had a single and 2 RBI. Jimmy & Rose had a single and a run scored each. Matt, Bill, Brett & BIG had a single each. Brett pitched 7 innings allowing 13 runs on 12 hits, while walking 6. 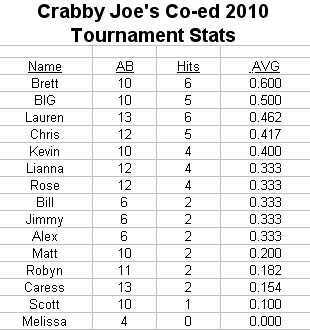 Final Score: Crabby Joe's 5 Lubies Car Wash 5.Lauren had 3 singles. BIG had a double, a single and 2 runs scored. Chris had a double, a single and a run scored. Brett had 2 singles, a walk and a run scored. Lianna had a single and a run scored. Kevin, Matt, Alex & Rose had a single each. Melissa drew a walk. Brett pitched all 7 innings allowing 5 runs on 15 hits, while walking 1 and striking out 1. Final Score: Bigshot Rivercats 12 Crabby Joe's 1.Chris had a double, a single and 1 RBI. BIG had a double, a walk and a run scored. 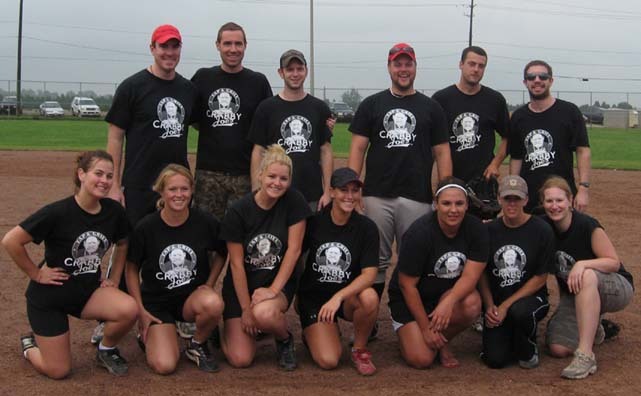 Scott, Brett, Kevin, Alex, Lauren, Robyn & Lianna all had a single each. Brett pitched 5 innings allowing 7 runs on 11 hits, while walking 4. Caress pitched 1 inning allowing 5 runs on 5 hits while walking 1.